R Owen, M Botros, S Uzair. Two Cases Of Gallbladder Agenesis Diagnosed At Planned Cholecystectomy – Lessons Learned. The Internet Journal of Surgery. 2009 Volume 26 Number 1. Gallbladder agenesis (GA) is a rare anatomical variation of the biliary tree. It may present with biliary type symptoms such as upper abdominal pain requiring further investigation. Ultrasound is the first choice of imaging for biliary symptoms but is frequently misleading in the context of GA. As a result most patients are diagnosed following conversion of laparoscopic to open cholecystectomy and subsequent failure to identify the gallbladder. Failure to suspect GA at laparoscopy can result in unnecessary open surgery and a high risk of bile duct damage with corresponding postoperative morbidity and mortality. We describe two cases of GA diagnosed at planned laparoscopic cholecystectomy with contrasting methods. Gallbladder agenesis (GA) is a rare anatomical variation of the biliary tree1. It is associated with unnecessary open surgery and significant morbidity at planned cholecystectomy due to bile duct damage2. We describe two cases found at planned laparoscopic cholecystectomy. The abnormality was demonstrated and managed with contrasting methods. We include one of the first examples of GA diagnosed at operation without recourse to laparotomy. a) A 72-year-old female presented with intermittent right upper quadrant pain. She was previously fit and well. Examination and blood tests were normal. Ultrasound imaging revealed a contracted gallbladder described as suggestive of cholelithiasis. In view of the clinical and radiological findings the patient proceeded to elective laparoscopic cholecystectomy. During the operation there was difficulty identifying the gallbladder laparoscopically (Figure 1) and the procedure was converted to an open cholecystectomy. Despite extensive dissection (Figure 2) the gallbladder remained unidentified and a diagnosis of GA was made intraoperatively. Further ultrasound imaging was performed to exclude an ectopic gallbladder. Following surgery, the patient made an uncomplicated recovery. 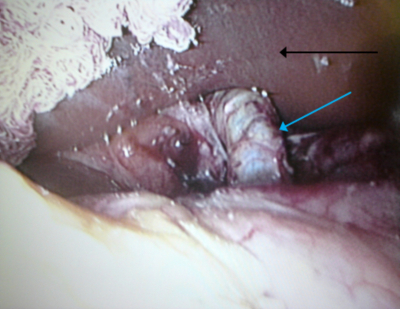 Figure 1 – Difficulty identifying gallbladder at laparoscopy (blue arrow marks common bile duct (CBD), black arrow marks liver). Figure 2 – Absence of gallbladder at laparotomy (usual gallbladder position identified by yellow arrow). b) A 25-year-old female presented with intermittent upper abdominal pain. She was previously fit and well. Examination revealed some right upper quadrant tenderness. Blood tests, specifically liver function tests, were within normal range. The findings on ultrasound scanning were of a contracted gallbladder, suggestive of cholelithiasis. The impression from clinical history and imaging was of biliary colic due to cholelithiasis and the patient proceeded to elective laparoscopic cholecystectomy. 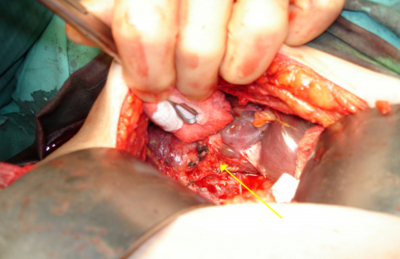 During the operation dissection was carried out laparoscopically (Figure 3) and the gallbladder was not identified (Figure 4). 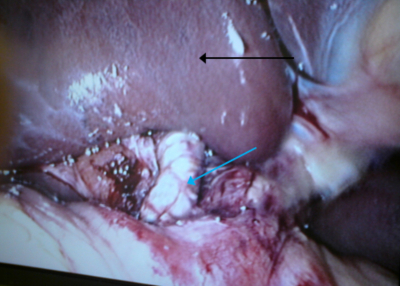 Figure 3 – Difficulty identifying gallbladder at laparoscopy (blue arrow marks common bile duct (CBD), black arrow marks liver). 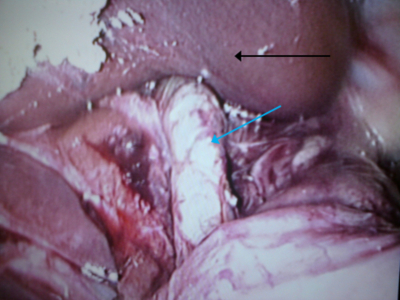 Figure 4 – With further dissection exposing the common bile duct, the gallbladder remained unidentified (blue arrow marks common bile duct (CBD), black arrow marks liver). Due to this failure to identify the gallbladder in its usual or any ectopic positions it was decided not to continue laparoscopic dissection due to anticipated risks of iatrogenic injury. Conversion to an open operation was considered but a decision was made to perform further imaging rather than proceeding to laparotomy. Subsequent computed tomography and magnetic resonance cholangiopancreatography (MRCP) also failed to visualise the gallbladder (Figure 5) and a diagnosis of GA was made. Following surgery, the patient made an uncomplicated recovery. 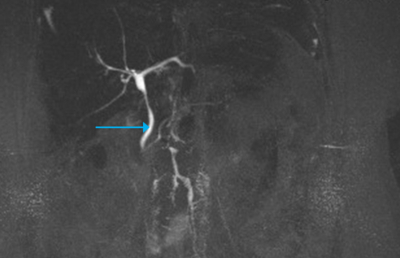 Figure 5 - Absence of gallbladder and cystic duct on MRCP (blue arrow marks common bile duct). The gallbladder arises with the bile duct and liver at week four of development. These structures arise from a ventral bud of the caudal foregut, the hepatic diverticulum. Initially these structures are solid but they develop lumina by week eight. GA is thought to be due to failure of development of vessels on either side of the gallbladder bud. The prevalence of GA is 0.01-0.04%1. Approximately half of cases are associated with other malformations or are part of a described syndrome (cerebrotendinous xanthomatosis and G syndrome)2. Symptoms of upper abdominal pain, nausea, vomiting and fatty food intolerance occur in 23% of all GA patients3. These symptoms are thought to be due to biliary dyskinesia leading to prolonged sphincter of Oddi contraction and biliary dilatation4. Imaging is frequently misleading in GA. The initial imaging of choice to investigate the cause of biliary symptoms is ultrasound scanning. This has a high sensitivity and specificity for the diagnosis of cholelithiasis5. In GA, ultrasound images have been described as scleroatrophic or contracted gallbladder. When associated with biliary symptoms these images can be interpreted as due to cholelithiasis6. Hepatobiliary scintigraphy may also be inaccurate as a failure to demonstrate the gallbladder is usually interpreted as a cystic duct obstruction7. Similar problems are encountered with intraoperative cholangiogram and endoscopic retrograde cholangiopancreatography (ERCP). MRCP does not require contrast or normal biliary system dynamics to obtain images and is thus able to diagnose GA8. However, in seemingly straightforward cases of suspected cholelithiasis it is not used due to time, expense and relative unavailability. Computed tomography (CT) scanning is also useful in the context of GA9 though is infrequently used in investigating suspected cholelithiasis due to poor sensitivity and radiation exposure. Intraoperative and endoscopic ultrasound imaging may also be of benefit but there is limited availability of these modalities. At laparoscopy, difficulties in identifying the normal anatomy normally lead to conversion to laparotomy to enable a more thorough dissection of the biliary system. In the context of GA, Calot’s triangle is altered and dissection in this area leads to a risk of iatrogenic injury to the biliary system with corresponding increase in operative morbidity and mortality2. Gallbladder agenesis is a rare but important finding to be aware of in laparoscopic cholecystectomy. In situations of difficulty in identifying the gallbladder laparoscopically, MRCP and CT scanning can be performed to diagnose GA avoiding recourse to laparotomy. Failure to suspect GA at laparoscopy can result in unnecessary open surgery and a high risk of bile duct damage with corresponding postoperative morbidity and mortality. 1. Belli G, D’Agostino A, Iannelli A, Rotondano G, Ceccarelli P: Isolated agenesis of the gallbladder. Minerva Chir; 1997; 52: 1119-1121. 2. Peloponissios N, Gillet M, Cavin R, Halkic N: Agenesis of the gallbladder: A dangerously misdiagnosed malformation. World J Gastroenterol; 2005; 11(39): 6228-6231. 3. Jackson RJ, McClellan D: Agenesis of the gallbladder. A cause of false-positive ultrasonography. Am Surg; 1989; 55: 36-40. 4. Sanders GB, Flores T, Arriola P: Congenital absence of the gallbladder and cystic duct: a review of the literature and report of a case. Am Surg; 1968; 34: 750-754. 5. Crade M, Taylor KJ, Rosenfield AT, de GC, Minihan P: Surgical and pathologic correlation of cholecystosonography andcholecystography. Am J Roentgenol; 1978; 131: 227-229. 6. Hammond DI: Unusual causes of sonographic nonvisualization or nonrecognition of the gallbladder: a review. J Clin Ultrasound; 1988; 16: 77-85. 7. Gad MA, Krishnamurthy GT, Glowniak JV: Identification and differentiation of congenital gallbladder abnormality by quantitative technetium-99m IDA cholescintigraphy. J Nucl Med; 1992; 33: 431-434. 8. Adusumilli S, Siegelman ES: MR imaging of the gallbladder. Magn Reson Imaging Clin N Am; 2002; 10: 165-184. 9. Cho CH, Suh KW, Min JS, et al. : Congenital absence of gallbladder. Yonsei Med J; 1992; 33: 364-367.